I was going through Country Living magazine a few months ago(April 2010 issue, I think) and came across a couple of recipes taken from Trisha Yearwood's new cookbook, Home Cooking with Trisha Yearwood: Stories and Recipes to Share with Family and Friends. Right away this 4-ingredient, easy little recipe jumped out at me. It helped that a photo was included:) Trisha explained that if her mom had just eaten a meal, she'd crave something sweet, or if she had just had dessert, she'd crave something salty. 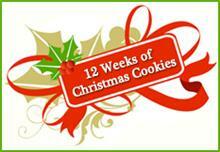 Hence the name of this fun treat:) I thought it would be perfect for "12 Weeks of Christmas Cookies." I'm not sure if it's a cookie, or candy, but everyone needs something quick and easy during the busy holiday season! I was very happy with how these turned out! They are akin to a Heath bar(toffee candy). Who knew? Just beware, it's very easy to break off a piece and just keep eating. I used my 17" x 12" pan to spread the mixture. 1. Preheat oven to 425F. Line a large rimmed cookie sheet with aluminum foil and saltine crackers. 2. In a medium saucepan, melt butter and brown sugar together and bring to a boil. Boil for 5 minutes. Remove from heat and pour over crackers, covering them evenly. Put cookie sheet into oven and watch closely. Bake for about 5 minutes, or until just bubbly. 3. Remove from oven and pour chocolate chips over crackers. When chips begin to melt, spread them over crackers with a knife. Transfer pan to freezer for 15 to 20 minutes, or until completely cold. The chocolate-covered crackers will form a solid sheet; break into pieces and store in an airtight container. I don't know why it deleted my comment above, but I just wanted to say that these look really good! I will definitely have to try to make them! Oh, and the donuts in the previous post are to die for. Seriously, they look unbelievably delicious! Thank you for posting recipes, yummy! OH MY YUM!!! Sweet and salty = to die for!!! Another great recipe from you! Oh boy, I've heard about these little sweeties for quite some time now but have yet to make them. They look so good. I have seen this delicious dish but never made it before. I need to give it a try this year...I know everyone will love it! I love saltiness in my candies. These sound delightful! YUM, what a great idea! This would be a hit in my family! This was new to me until a couple years ago and a friend sent me a bunch of her holiday goodies. I demanded the recipe for these saltines! yum! Thanks for hopping over and leaving your sweet comment on my choc chip butter cookies post. Thanks for sharing this recipe! Looks very easy to make! Your blog header is cute btw! Have a nice weekend! These look so yummy. I haven't ever made them but have heard about them. I will have to join in the 5 weeks now that Halloween is over. Looked at your donuts! Mine have never turned out that tall and fluffy, ususally yucky and greasy. Maybe tomorrow would be a good day to try them. I have had those and they are sinfully addicting! They would be great on a Christmas goodie plate, that's for sure. I love the combination of sweet and salty. What a fun and quick treat to make. I've heard this called "crack" because it's so addicting. It is good stuff and perfect for the holidays. I've bagged it up with ribbons before to give it away. I love sweet & salty snacks! Sweet and salty has always been a weakness of mine. I'll not be making these unless I have a full house. Thanks for the recipe! My aunt makes these for certain occasions and my aunt nick named them to die for(s) , also their absolutely delicious.I lost my aunts recipe and found this one on pintrest so Thank You !